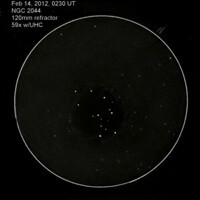 This gallery is from the Inaugural RASC Astroketchers' Contest. The entries for the first RASC Astrosketchers' Contest have now been received, and they are of stellar quality! Now it's time for the judging to begin, and the judges are you, the members of the RASC Astrosketch community! The judging period runs from now till 2012 March 18 inclusive. To express your preference, send an email to astrosketchers (at) lists (dot) rasc (dot) ca with the subject line "Astrosketch vote", and in the body of the email specifythe name of the artist, and the title of her or his image which gets your vote. Please only vote once, for a single image! This is a sketch using pastel chalks, white charcoal pencil and a wight gel pen on black pastel paper. I did this sketch in the cold late night of last summer. The sky's where very clear and the temperature had dropped to +2C. Cold considering it was +30 that afternoon. The pastel is brushed onto the paper and then smudged in with a blending stump.darker areas are added with a kneed able eraser. Stars are done with the gel pen as well as the white charcoal pencil. 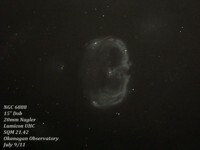 This is a really neat nebula to see with a large instrument from a dark location using some decent equipment. I made the sketch the next day from the field sketch that I did at the eyepiece. It is very hard to work with chalk and pastels in the dark as well as a cool damp environment. So I do a good copy of the sketch the next day in a more controlled area. This is a nice alternative to inverting them in the computer. I did add the sketch info once in the computer before e-mailing it. 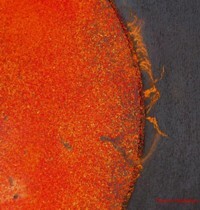 First solar observation of 2012. Yes the main Active Region that morning looked very detailed, but the hedge proms on the east limb were outstanding, and very busy indeed. 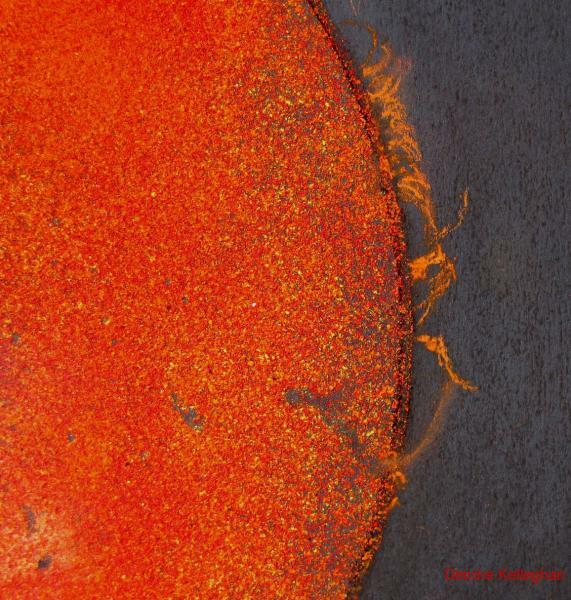 A long rope like filament arched upward above the chromosphere, whipped round the limb becoming that very dramatic feature the filaprom. PST 40 / 8mm TVP eyepiece / 50X. Seeing good. Pastel and Conte on black paper. Alexander Massey, Aristarchus, Herodotus et Vallis Schroteri WINNER! 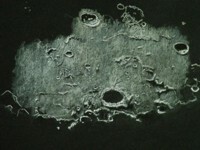 This sketch is of one of the brightest features on the Moon, the crater Aristarchus. The brilliantly illuminated internal western wall requires time to spy out the many fine details within it, otherwise these features would be washed out. 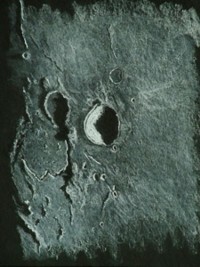 A myriad of riles radiate out from this crater. I’m throwing my hat into the ring with this sketch of the crater Hercules and surrounds. An average night’s start ended with quite stable conditions to be able to see very fine details. A multitude of fine riles, escarpments and stunning long shadows along the terminator was a dramatic scene I could not resist. The setting Sun had the rugged moonscape of Hercules at its dramatic best. The crater walls are stepped, jagged and craggy. Highlights contrast with the depths of black shadows. The challenge was to lay down a faithful representation of this impressive scene. Media: White pastel, black charcoal and white ink on A4 size black paper. 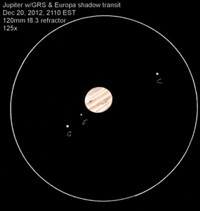 Jupiter Europa Shadow Transit WINNER! Both sketches were done at the eyepiece then cleaned up and inverted using Corel Paint Shop Pro. The colour in the Jupiter sketch was added using coloured pencils. We look forward to congratulating the winner, the awarding of the prize, and publication of their image. Good luck!